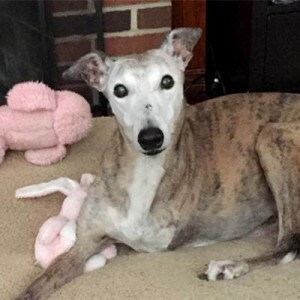 Tripawds Community member ekolu is recipient #30 of the Maggie Moo Fund for Tripawd Rehab. 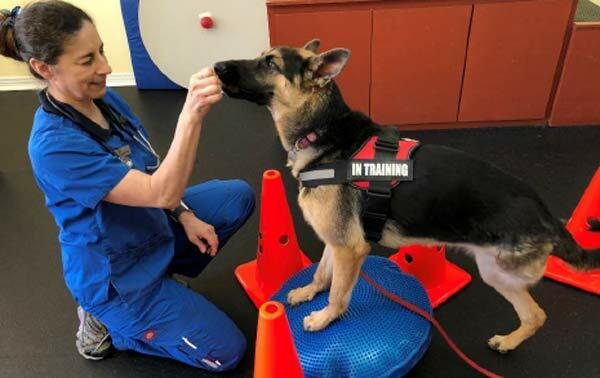 Read on for details about the benefits of his canine rehabilitation session in southern California. A friend heard we were looking for a new dog and she referred me to Coastal German Shepherd Rescue. After looking at their available dogs, I fell in love with one of their younger dogs, at the time, named Micah. After going through the adoption application and home check, we got to meet Micah at her foster mom’s house. Micah had the best temperament and she instantly bonded with my 6 year old daughter. We were approved by the foster mom that our family would be a good placement for Micah. Although there was one drawback, at 5 months of age, she had her left hind leg amputated due to an accident. The animal shelter where she was taken suspected she was hit by a car and made the decision that the leg couldn’t be saved. Micah was rescued by CGS and after 2 months of recovery with her foster mom, she was deemed ready for adoption. We officially became her new family on December 23, 2017. We renamed her Ekolu (eh-koh-loo) Hawaiian for “three.” Ekolu quickly acclimated to our family and is a very quick learner. We’ve taken her to one round of puppy obedience school and are currently working with a dog trainer. We hope in the future she can become a therapy dog. After a lot of research on the internet, I came across Tripawds. It’s a wonderful site with so much information. Since this is our first three legged dog, I wanted to make sure we were doing the right thing to help ensure a long, healthy lifetime. 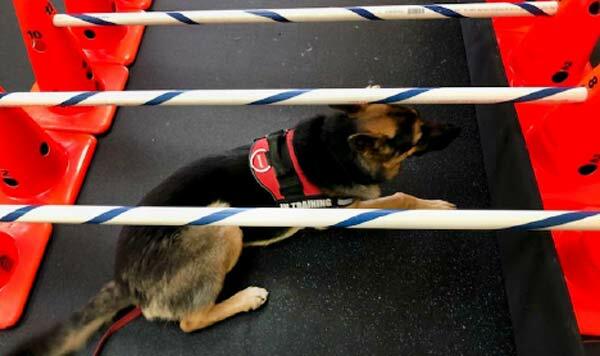 It was suggested by the Tripawds Foundation to take our dog to canine physical therapist. I’m thankful we live in Southern California and we have access to such great canine care. 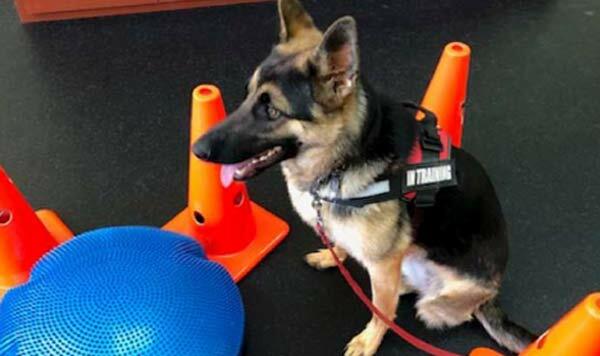 I was able to find a therapist using caninerehabinstitute.com. Slow leash walking prolongs their hips and doesn’t wear them out. Having pet stand with their front limbs on steps in front of them, using a treat in your hand, making sure weight is evenly distributed, holding for 15 seconds, which also stretches hips and back. Sit to stand squarely and symmetrically to help elongate the back and building strength in dog’s core and remaining hind leg, 4 sets. Back extension from sitting position, with a treat, keep a little out of reach of pet’s nose helps elongate the curvature in the back, 2 sets, holding for 5 seconds. Cookie stretches to the hip, with a treat, in standing position, encourage pet to bend its head and neck toward the hip and hold for 10-15 seconds for 2 sets. This will increase flexibility. Using a balance board, have pet’s front limbs on balance board. Have pet stand as long as they can (hold for 15 seconds). Will help build core strength. While pet is laying on their side, gently stroke and knead the muscles around the hip joint to relieve muscle tension in remaining leg (2 to 5 minutes). I’m glad we took the extra step and made the time to seek out a specialist. We learned we may have been pushing Ekolu too hard and could have caused undue injury. Ekoluis absolutely beautiful! And she clearly won the PuppyLottery when you picked her…or she picked you…or both!! Thank you for taking the time to share her Rehab visit. You did a very thorough job and gave a lot of great detail. This will be a very helpful “go-to” tool for anyone wanting to do some at-home therapy.